By Derby artists and designers that exemplify the Derby style. Porcelain plates, figures and vases that demonstrate the superb quality of Royal Crown Derby products. Not all Derby products are as collectible as the items featured below and most are well within range of any porcelain collectors budget. The products we feature here are simply used to demonstrate what you could find. If you search hard enough. William Pegg’s flowers are often life-size, and cover the whole of a cabinet plate. The gilding is usually quite restrained and understated. 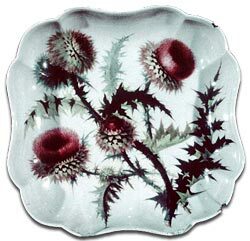 William Pegg’s study of a thistle is considered one of the finest depictions of a plant ever painted on porcelain. Beautifully decorated with floral groups and rose sprays set in vignettes against a mazarine blue border. The blue ground border enhanced with a trailing grape vine in raised gilding. Floral decoration by William Billingsley who was apprenticed to Derby in 1774. Painted between 1778 and 1782 shortly before or soon after Billingsley completed his apprenticeship. 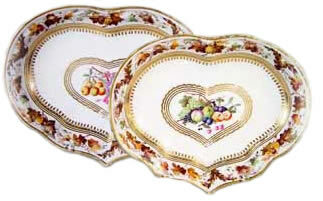 These Derby porcelain dishes are decorated with fruit within a heart-shaped gilt border. The fruit including grapes, plums, strawberries, raspberries and apples amongst others. 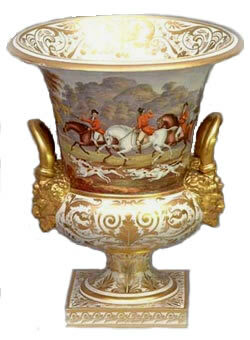 The rim in yellow highlighted with gold with a continuous polychrome leafy border. 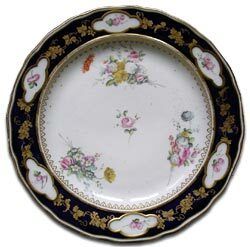 A fine Derby Porcelain plate by John Brewer. 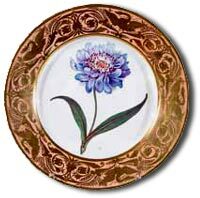 The finely painted service is boldly painted with botanical specimens, titled in red script to the reverse. The richly gilded borders with swans and stylised flower-heads are on a rich salmon ground. Diameter: 8 7/8 inches (22.5 cm) . Derby Marks: c1815. Crown, crossed batons and D mark in red, numerals 4 & 13 in yellow & green inside footrim. With Landscape by Zachariah Boreman and Roses by William Billingsley. 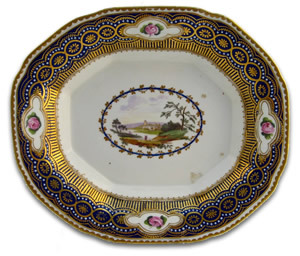 Elaborately decorated in pattern 35 within a beautiful rim of blue and gilt with applied pearls. Billingsley’s long tailed 7 can be found in the footrim. Derby Porcelain, an Illustrated Guide. Derby Marks: c1788 Derby mark in puce. A fine Duesbury and Kean period campana by William Cotton. A rare and fine Derby porcelain Duesbury and Kean period campagna urn. The flared vase extremely well painted by William Cotton with riders and hounds to the hunt within an extensive Derbyshire landscape. Derby Marks: c1815. Red crown, crossed batons, dots and D.
A superb pair of Derby Porcelain botanical twin-handled vases by William Pegg. The vases of crater form, painted with a band of richly coloured flowers around the flaring neck. 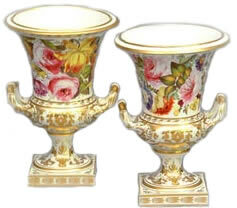 The lower body, twin handles, foot and square base with gilt foliate scrolls. 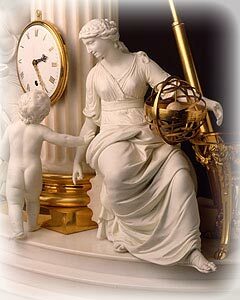 The astronomy clock by Benjamin Vulliamy. This clock shows clearly how the style of ornamental clocks produced by the leading London clockmakers, Vulliamy & Son of 74 Pall Mall, developed during the late 18th century in response to changes in fashionable taste. It was in the early 1780s that Benjamin Vulliamy (1747-1811), King’s Clockmaker and junior partner in the family firm, began to develop a range of ornamental clocks to challenge the dominance of French pieces in Society drawing rooms. 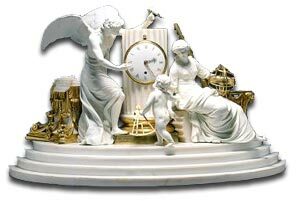 Although he would certainly have known of Matthew Boulton’s clocks with allegorical figures in ormolu, produced in the 1760s-70s, Vulliamy’s immediate inspiration probably came from contemporary French clocks. These occasionally used biscuit porcelain figures instead of ormolu and Vulliamy seems to have preferred the cooler neo-classicism of the former. Although Vulliamy himself would have been responsible for the overall design of these clocks, he employed highly talented young sculptors to model the figures. His practice was to use prize-winners from the Royal Academy Schools who, he evidently hoped, had acquired not only the necessary skills but also an understanding of the latest neo-classical taste. Once modelled, the figures were sent to Derby to be reproduced in biscuit porcelain for Vulliamy’s sole use. Surviving correspondence between Vulliamy and the Derby factory shows the serious technical problems which the factory faced in producing figures of the precise size, colour and quality demanded by Vulliamy. As a result, production of the larger figures was slow and they were expensive: Vulliamy was charged 5 guineas each (later increased to 6 guineas) for them. Vulliamy’s first designs for clocks with Derby biscuit figures were relatively simple, but by the mid-1780s he had developed some larger compositions using three biscuit figures (two large and one small). While the fifth, dated 1785, is the present clock. A sixth clock, seen by Sophie von La Roche when she visited Vulliamy’s shop in September 1786, may possibly have been the latter, though she described the seated female figure as reading a book. Except for No. 178, all seem to have used the same basic composition of figures, forming an allegory of time. The date 1785, the fact that the movement is unnumbered and the marble scroll inscribed, ‘Design’d & Executed by B. Vulliamy (etc. )’, would all suggest that this was the earliest of the group to be completed. The large figures of a winged Genius and Urania holding an armillary sphere (symbolic of astronomy), were probably inspired by engravings in Montfaucon’s ‘Antiquity Explained’, a favourite design source for Benjamin Vulliamy, and modelled by John Deare (1759-98), Gold Medallist at the Royal Academy Schools in 1780. It was not just the biscuit figures of these clocks which were contracted out. As was normal in the London clockmaking trade, most of the various elements, including the movement, would have been made to Vulliamy’s precise specifications by independent specialists, with only final adjustments being carried out in Vulliamy’s own workshop. In this, his practice was similar to that of his French competitors, the Parisian marchands-merciers. However, unlike many of their French counterparts, Vulliamy’s clocks have movements of quality commensurate with their cases. The single-train movement of the present clock is a good example of the high quality workmanship found in Vulliamy’s products. With its long, narrow plates, it was clearly made specially to fit the marble column of the case. Characteristic Vulliamy features include the use of a half dead-beat escapement, (more accurate but more difficult to make than the verge or anchor escapements commonly found in English bracket and table clocks of this period); and the small square for ‘rise and fall’ adjustment of the pendulum, above 12 o’clock on the dial, (neatly concealed on this clock by a removable ormolu rosette). The original price of this clock is unknown but it would have been expensive even for Vulliamy, (who was notoriously costly), and certainly well in excess of the 100 guineas which he is known to have charged for clocks with a single large Derby biscuit figure.